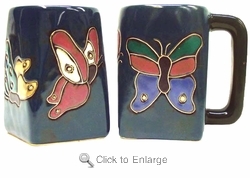 If you are interested in butterflies, then this Mara Butterflies Square Bottom Coffee Mug is for you. You can see all Birds and Butterflies theme products here Birds and Butterflies. You can also check out our Mara Mugs 16oz Round Bottom here Mara Mugs 16oz Round Bottom. Approximate dimensions (l x w x h): 4.25" x 3" x 4.5"